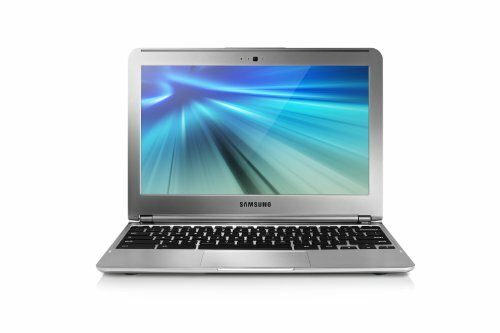 The Samsung Chromebook 11.6" netbook is a great low-priced laptop, with a pretty good specification considering it's price. For sale at around £230.00, it offers a speedy 1.7GHz processing power in addition to 2GB of RAM, with the Chrome OS from Google. This is not a regular sized laptop - it doesn't have the usual Windows 7 installed - but is it any good? Read on for our review. Below is our review of the Samsung Chromebook, a 11.6" laptop, featuring 2GB RAM, 16GB SSD hard drive and Chrome OS. The first thing to point out about this netbook is that it runs on Chrome OS and not Windows - and as such the majority of the applications and software you can use require an internet connection to work - as they aren't stored on your computer, but are cloud based instead. This means the netbook runs very fast, which is helped by the inbuilt SSD. The system runs very fast, and boots up in a matter of seconds - due to a combination of it's solid state drive and Google Chrome OS. Battery life is good for a netbook, lasting just under 6 and a half hours from our test period. A crystal clear Samsung 11.6" screen performs well, and is easy on the eyes as well as being pretty crisp at a resolution of 1366 x 768, and if you wish to use the HDMI port, you can output to your television/monitor in full high definition.. Audio-wise you have a fairly reasonable set of inbuilt speakers. Unlike most laptops, the system runs silently - no noisy hard drive / fans in this machine, only a speedy SSD - so no moving parts, which should make this netbook very durable. The keyboard and trackpad controls performed well – the trackpad is fairly big, considering the small size of this netbook. Again the keyboard is virtually silent, as per the rest of the netbook, featuring a pretty spacious layout, spanning the width of this 11.6" notebook. In terms of connectivity it features a USB 2.0 port, a USB 3.0 port, and HDMI out, so you'll be able to output to a TV or monitor if you so wish. Also included are the headphone and microphone combination, as well as a webcam. It looks well designed - mainly made of plastic, but feels sturdy and looks pretty good. Now on to the impressive bit - with no regular heavy SATA hard drive, it weighs a svelte 1.1kg, with dimensions of just 28.9cm x 20.8cm x 1.7cm - incredibly slim, highly portable and ideal for travelling with. Included in the box are the netbook itself - the Samsung Chromebook WiFi netbook, an AC adapter, a power cord, and a user guide. Pros: Pros: Very inexpensive, runs silently, very portable, decent battery life, and very fast at what it does. Cons: Cons: No Windows installed (if you're used to that) - SSD is only 16GB. To conclude – a decent netbook which will be ideal for those who just want to browse the web and other household usage, from a decent manufacturer in Samsung, at a bargain price.